This is my entry to the Feed-A-Hungry-Child-Campaign, a group book idea by VKN of My Dhaba. Egg Pilaf is one of my favorite comfort foods. And for a comfort food, it is prepared very easily and quickly! A blend of lightly spiced basmati rice and chunks of hard-boiled eggs, egg pilaf is a nutritious one-dish meal. Tossing in some nuts and raisins elevates it to a festive dish that makes ordinary weeknights special. The beauty of egg pilaf is that all the ingredients are pantry staples, so it can be put together even at times when grocery shopping is way overdue. You can use any type of garam masala for this dish, whether home-made or store-bought, but my own favorite is my Mom's blend that is so aromatic that I call it Magic Masala. You simply take equal parts of cinnamon, cardamom and cloves, say, 1/4 cup each cardamom seeds and cloves, and 1 big cinnamom stick, toast them together on low heat to coax out the flavors, and then dry-grind the spices together in a spice blender to a fine powder. I store the powder in a little airtight jar in the freezer and it tastes fresh for a long time. 1. Hard-boil the eggs: Place eggs in a saucepan and cover with water. Bring water to a boil, then simmer for 12 minutes. Drain the hot water, then rinse the eggs in cold water. Peel the eggs when they are cool enough to handle and set aside. 2. Cut the onion into half from root to tip, then cut each half into thin slices. 3. Place 2 1/2 cups of water in a pot to heat. 4. Heat oil in a large pot, and stir in the cumin seeds. Add sliced onion and fry first on medium-high heat for the edges of the onion to brown, and then on medium-low heat till the onions are very soft and caramelized. Browning the onions gives them a rich, deep flavor, so don't skip this step. 5. Now add the ginger-garlic, turmeric, chili powder, garam masala, salt and fry for about a minute or so. Stir in the cashews and raisins, then add the rice and hot water. 6. Cover the pot and simmer until most of the water is absorbed and the rice is tender (test a grain with your finger). 7. Let the rice rest for 15 minutes, so that the water is completely absorbed. Then fluff the rice with a fork, and toss with slices of boiled eggs. Garnish with cilantro and scallions. 1. If you are watching your cholesterol intake, remove and discard the egg yolks and use only sliced egg whites. 2. 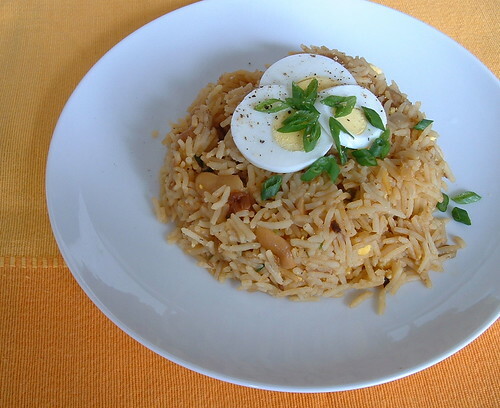 Egg pilaf pairs well with yogurt raita (salad). Yum! And thanks for sharing your Magic Masala formula, too. loved the recipe of pilaf and the magic masala. picture looks great too. but not sure if you really meant cinnamon seeds?? never heard of that??? "You simply take equal parts of cinnamon seeds, cardamom and cloves"
I have tagged you for a simple meme. Take it if you like it.Thanks! I love egg and any recipe that has egg. This looks delicious. Thanks for sharing this simple recipe. Hi Anonymous, thanks for pointing out the typo...I meant cardamom seeds (the stuff inside the green pods). 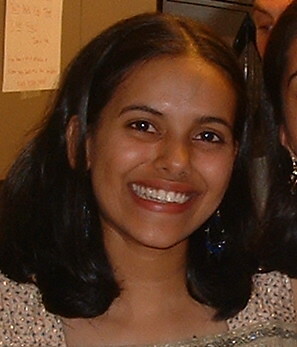 Hi Pavani, glad you like it! This sounds yummy! Can't wait to try it! Waiter...there is some Dhokli in my Dal!